For the record, we definitely recommend allowing a couple of days for Florence – the museums alone could take a full weekend. If you have to see it in a day, though, we’re here to help! Get ready, because this day is going to be packed. You arrive at Santa Maria Novella train station – or near it, and because this is Florence, and Florence is small, everything is close to the station. Immediately walk to the center of the city and its crown jewel, the Duomo. Arrive early enough and you can get a good look at Brunelleschi’s magnificent dome before the piazza is full. If you want to climb the tower or the dome, now is the time to do it, before the lines get too long. Worth every one of the 140 years it took to build. When it’s time for breakfast (or a snack, if you’ve already eaten), head north to Mercato Centrale – a large glass and wrought-iron building; believe us when we say it’s hard to miss. Grab a cappuccino and a pastry, then wander the building and admire the stalls. Whether you’re looking for truffle-infused olive oil, the perfect bottle of wine or simply some rustic bread, you’ll find it here. Now head back towards the center of town – but on the way, stop for a quick look at the Basilica di San Lorenzo. 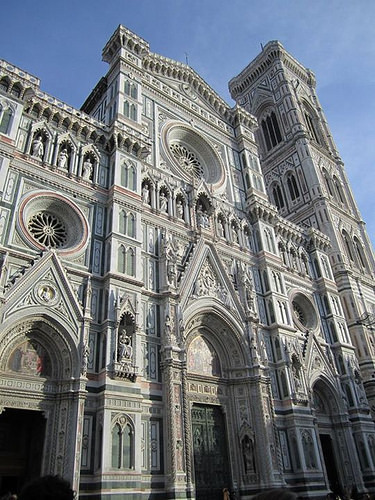 This was the parish church of the Medici family, who ruled Florence from the 15th century until 1737 and whose members included four popes and two queens of France. Take note of the family’s coat of arms and keep track of how often you see it as you wander the city (it’s easy to recognize, making this a good game for kids). 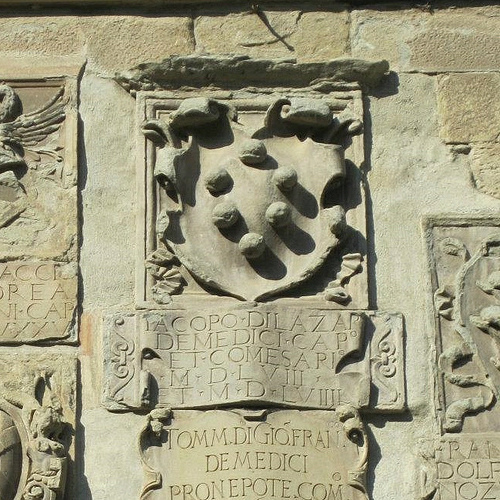 If it’s in color, the balls (palle) are red – sometimes the top one is blue with a fleur-de-lys. Stroll back toward the Piazza del Duomo (now much more crowded) and walk south along Via dei Calzaiuoli, the main thoroughfare of central Florence. Stop for pictures (and some shopping, if you like) in Piazza della Repubblica. If you’re hungry, turn left on Via dei Cimatori and stop at I Due Fratellini, a literal hole-in-the-wall where you can get two small, tasty sandwiches for five Euros. There will be a crowd at lunchtime, but don’t worry, the line moves quickly.Soltanto contolti, per favore ­– cash only, please. Continue on to Piazza della Signoria, where you’ll see Palazzo Vecchio, the seat of Florentine government since 1299. And standing guard out front is Michelangelo’s David – or at least a very good copy of it. The real one is north in the Accademia, which, while worth a visit, is hard to fit into this one-day trip. Wishing you had more time, and longing to come back? 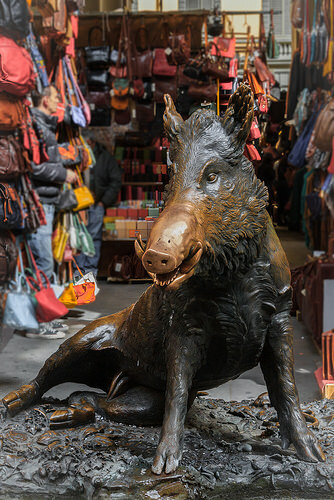 Visit Il Porcellino nearby – this boar statue brings luck to anyone who places a coin in his mouth and lets it fall into the grating below, and those who rub his well-polished snout are guaranteed a return to Florence. Just don’t mention the fact that you ate his cousins for lunch. If you like museums, you’ve come to the perfect place. History buffs should visit the museum inside Palazzo Vecchio to learn about Renaissance Florence and the Medicis. If you’re an art person, head to the Uffizi nearby and enjoy all the Botticellis, Leonardos, and Caravaggios you can take. Be sure to buy your museum tickets and reserve your entrance time ahead of your trip – the lines here can be brutal. Would you prefer to sit at a café and people-watch while enjoying a coffee and a snack? Then Florence is your oyster. 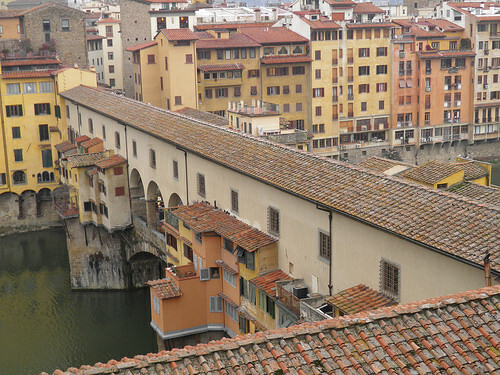 Afterwards, head across the Ponte Vecchio (don’t get too distracted by all the jewelers’ displays!) into the Oltrarno – this is real Florence. If you have time, the Pitti Palace, home of those infamous Medicis and the Boboli Gardens, is well worth a visit. Or simply wander the narrow streets and enjoy what Italians call “la bella vita,” or the beautiful life. You’re staying for dinner, right? You’d better be, because we’re sending you to our favorite restaurant in all of Florence. Trattoria Pandemonio is family-owned and family-operated, and the food tastes like everything your lovely Italian grandmother would have made, if you had an Italian grandmother. Try the fried artichokes, and when they bring around a big bottle of limoncello, you’ll have to take some. It’s only polite. Now, reasonable people can disagree on the best gelateria in Florence. But we are not reasonable people, and therefore insist that you visit Gelateria La Carraia. Located next to the Ponte Alla Carraia, two bridges west of Ponte Vecchio, La Carraia has some of the most decadently creamy gelato we’ve ever tried. No recommendations, here – get what you like. They’re all good. Eat on the bridge, and from there it’s only a short walk back to the train station, where you can grab your ride out of town and immediately start planning how you can come back.